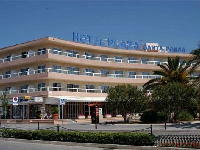 The Hotel Plaza is perfectly situated right across the road from the main beach and in the centre of the lovely resort of Santa Ponsa. This comfortable hotel has a light, sunny restaurant for your half board basis meals and a small swimming pool. The attractive rooms have optional air conditioning (payable locally). Everything is close at hand with all of the bars, shops and restaurants of the resort only a short walk away. More importantly, the beach couldnt be more convenient and is a wide stretch of white sand with plenty of sunbeds and a range of watersports on offer. The Santa Ponsa Golf course is just a short taxi or car ride from the hotel, so its the perfect base for golfers! The hotel offers its guests discounts in the popular 'Diabolito' Pizzeria, and also in the bars and snack bars of the sister complexes and the well known 'Finnegans Wake' bar.